It would be years before I consciously realized just how heavily influenced my gaming and creative life had been by one game series. If you asked me in high school or the first several years of college who my favourite video game characters were, I would always give the same answer: Pit, Mega Man, Link, Tails, Toad, and Kirby. Similarly, I'd have cited those characters' six series, plus Squaresoft's Final Fantasy, as my favourite game series. And yet, the whole time, I was failing to give due recognition to another game series that had managed to hold me in its thrall time and time again, dating back to one of my first few exposures to the Nintendo Entertainment System. It was a new chapter. My aunt, uncle, and cousins had moved, leaving behind their old house and finding a new, larger home in a new neighbourhood. Their former house was one of a great deal of memories for me: curling up in their empty fireplace (which I never saw used), swimming in their pool, playing with the dog, and, of course, my first exposure to the NES, Super Mario Bros., and—most importantly for the purposes of Videoland—Kid Icarus. After all, to a six-year-old, the memories of even one year ago were all huge, significant milestones. There was plenty to love about their new home, however. It was spacious; with plenty of room for entertaining. My aunt would go on to become the host for most of the family gatherings on my mother's side, and the new house was perfect for it: large enough to contain the chaos of a large, exuberant family and still give people breathing space, but not so large as to leave people feeling lost. When we went to visit, the older of my cousins had several friends over. The NES had yet to find its permanent home, and was currently sitting in what would later become a home office, next to a cardboard box full of games. The system was plugged into a monitor, and it was running something new, a game I had never seen before. Red. That was my first impression. The walls were made of red stone, and a man in yellow and brown was trying to navigate a fairly straight candlelit hallway, a seemingly simple task that was complicated by a swarm of flying blue heads—with snakes?—that swooped through the hall in a sine wave pattern. One of the very first things I noticed, besides the graphics, was the music. A rich base line (well, as rich as could be produced by the NES's little sound processor, anyway), thumped away a moody and enthralling rhythm, a piece I would later know as "Stalker" and call my first favorite piece of game music. My cousin's friends were crowded around the system, watching as the man in brown swung a whip as he attempted to make his way down the hallway. In the middle of the hallway, a small window was set near the ceiling, through which the indigo night sky could be seen. The man jumped, whacked the candle in the window, and a dagger fell out. Now the man had two weapons to use. Midway through the hallway, a small raised platform was set in the floor. The man stood still on it for a few moments, and a treasure chest rose from the ground, while beyond the platform, knights in steel armour patrolled stoically back and forth. The request was met with groans from my cousin's gaggle of friends. Of course the little kid would want a turn. But then one of them grinned wickedly. "Sure, let him try. He can have one life." Slow smiles appeared on the faces of the rest of the group, and the controller was thrust into my eager hands. I didn't even make it down the hallway. No sooner had the stage started than my hapless vampire hunter was swarmed by the flying medusa heads, and I, unused to the game's idiosyncratic whip timing, was helpless to defend myself. Snickering, my cousin's friends lifted the controller back out of my hands as I stared woefully at the crumpled body lying on the stone floor. I would become used to seeing that crumpled form over and over again, because, while I had no idea what I had just transpired in my ill-fated 45-second visit to those haunted halls, I was hooked. And so, Stage 05 in Block 2 became my first exposure to Simon Belmont and Castlevania, and both character and game would go on to become among my all-time favourites. I came away from the experience with nothing more than the name of the game: Castlevania, but it made an impression. Left without a game to play and with my beloved cousins both occupied with their friends, I went down to explore more of the new house, and wandered into the basement. My aunt's basement would eventually become beautifully furnished, the new home of the extended family's joyously chaotic Christmas Eve parties after my grandparents sold their house, but for now, it was simple and gray, with a cement floor and exposed insulation in the walls (which used to terrify my mother, who was convinced we would inhale fiberglass shavings whenever we went down there). As I looked around, however, I spied a single small window, set high up near the ceiling of the basement, through which just a little bit of the pale outdoor light could be seen. Instantly I was transported away in my imagination to that gloomy hallway in Castlevania, dodging around bobbing medusa heads, whipping the candle in front of the window and grabbing the dagger that it somehow managed to contain. It wasn't much to go on, but for a little six-year-old's overactive imagination, it was enough. And it was all I would have, at least for a while, until a few short months later when my brother and I earned a NES of our own for his birthday (and, by extension, mine, which followed his by a month and a half). The decision of what to buy was my brother's. Rather than get a fancy system with the pack-in games of Super Mario Brothers and Duck Hunt, or the even more expensive option that included the endearing R.O.B (Robotic Operating Buddy) and an additional software title, my brother successfully argued the merits of the simpler option, just the basic system. No toy robot, no light gun, not even an included game. Just the system, two controllers, and something called the Official Nintendo Player's Guide. He then made the reasonable request to my mother that, with the money saved by buying the less expensive system, he choose a first game of his own: he selected the Namco-created and Sunsoft-distributed Skykid, a phenomenal game about which I could (and should) easily devote an entire post. There are a number of stories to tell about when we first got the system--how my brother's friends pooled their money to surprise him with Konami's Top Gun on his birthday, how my mother came home one day and presented us with Super Mario Brothers because we had played so well together with Skykid, and so on--but the important story for today's purposes is how my brother, upon opening the big box with our NES, magnanimously handed me a thick black book and said, "Josh, this is for you." I was already a fan of video game manuals, having pored over the documentation for Kid Icarus, Super Mario Brothers, and the handful of games we owned on the Commodore 64. This, however, was something different. A product of the partnership between Nintendo and Japan's Tokuma Shoten Publishing that would produce Nintendo Power Magazine a year later, the Official Nintendo Player's Guide had in-depth information about a select 24 NES titles, plus brief summaries of the 90 games available on the NES at the time of its publication, and a quick 11 more mentioned briefly as coming attractions. I of course wasted no time in diving into the guide, and got into the habit of carrying it around with me. The summaries of games like The Legend of Zelda, Metroid, and (of course) Kid Icarus were ones that I read over and over, but perhaps the one that got the most attention from me was the section on Castlevania—the book was opened to the Castlevania section so often that the spine eventually split at the beginning of the section. The guide described the game's mechanics in detail, including screenshots of each of the title's items and monsters. 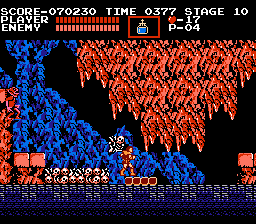 The Castlevania series would eventually become a sprawling, genre-bending franchise, but so much of the game's core mechanics were firmly established right out of the gate. Simon had his whip, which could be powered up to a lengthy chain whip through strengthening items, and a set of five subweapons, requiring hearts as fuel: The Dagger, fast but weak, with a strength equal to that of Simon's unpowered whip; the Axe, a very strong weapon which flies in an awkward high arc; the Firebomb (really Holy Water), a glass vial of consecrated liquid that hits the ground with a satisfying crash and immediately bursts into flames upon contact with any part of the unholy castle; the Boomerang, known always in Japan simply as the Cross, a pair of blue pointed stakes lashed together in a cross shape, which flies slowly through the air like a boomerang; and the heart-hungry Stopwatch, which freezes all action on the screen for a precious few seconds, but is completely impotent against most of the game's stronger monsters. The monsters! Many of the big ones were there right from the beginning: the bobbing, infuriating medusa heads; the swooping bats; the stoic, spear-wielding armour knights (a favourite of mine) and their bulkier, shield-bearing axe-knight cousins; the fire-breathing dragon skull cannons; the not to mention the grim-reaper himself. The game set the tone for the series, a kind of who's-who of haunted houses, pulling in monsters from every B-movie available and tossing them all into one giant castle, headed up by the Count himself. It nailed the concept right from the beginning—every single item and enemy from that first game has gone on to appear in subsequent games in the series, and even the format of the first long entrance hall appears again and again throughout the series. That last bit is an important point, because the game's title is well-chosen. The game is not all about hero Simon Belmont (in fact, neither the game manual nor the Official Nintendo Player's Guide even identify Simon by name in that first game; he isn't named until the game's ending, and then with the surname of "Belmondo", by which the vampire-hunting family came to be known in Japan), nor is it focused on Dracula, who doesn't make an appearance until the end. This game is about the Castle, which is the real star. Even the Japanese title 「悪魔城ドラキュラ」 translates literally as "Demon Castle Dracula", giving as much focus to the Castle as to its Count. Later games would even ascribe the Castle a degree of agency, identifying it as a creature of chaos, but the groundwork is laid out here, where every stage takes you to new, creepy surroundings, with each stage having an distinct character and feel. The Official Nintendo Player's Guide only covers the first three blocks of the game, each containing three stages, covering exactly half of the game's content. By the time I got my hands on the castle-in-a-grey-cartridge (my cousin eventually let me borrow it), I knew those first areas inside and out. There were plenty of secrets—life-giving meat hidden away in the walls, places to stand that would cause treasure to appear, which in turn would put you closer to important, point-earned extra lives—and if it was called out in the player's guide, I knew of it. Just because I had the maps memorized, however, didn't make me actually any good at the game. 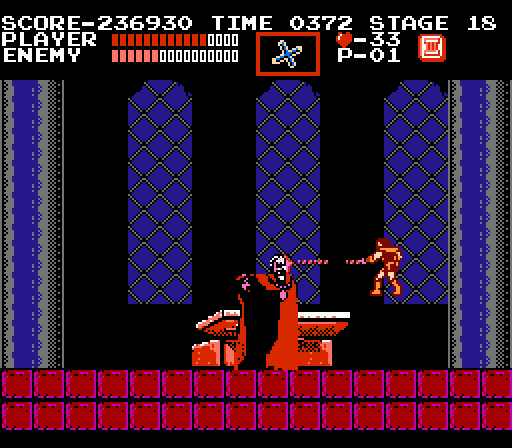 Castlevania has a learning curve. It might seem steep, but with only 18 stages, the curve had to ramp up quickly to pose a decent challenge. And that it does—in spades. The game mercifully offered unlimited continues, but using one would boot you back to the beginning of whichever three-stage block you were on, giving you a lot of ground to make up. And, truly, that was one of the things that made the game so memorable to me. 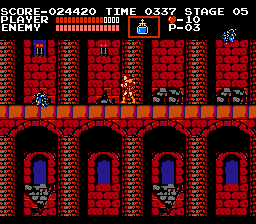 Castlevania was the first game to really give me a concrete feeling of getting better at a game. Other games I had played at the time had shortcuts (like Super Mario Brothers) or had some way to save your progress when you were stuck and come back later (like The Legend of Zelda and Kid Icarus). 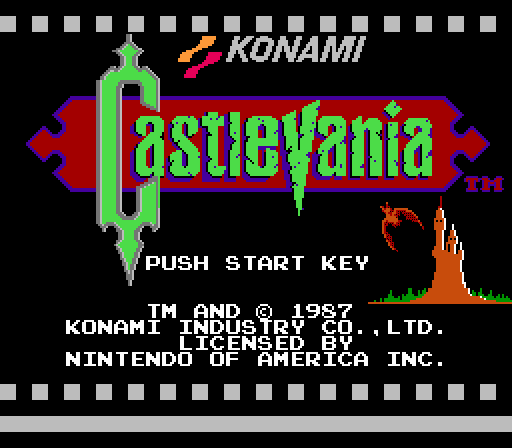 Castlevania, however, had none of those things: turn the game off, and when you turn the power back on, you're right back at the Castle gates. That was part of the game's strength, however, and the feeling of improvement when you can breeze past early parts of the game that were once painfully difficult is palpable. The early entrance hall was always a straightforward experience, but those bobbing medusa heads in Stage 05 took some getting used to, especially when there were small platforms to traverse. Eventually I was able to get to the blue-hued walls of Block 3, but making it to the end of Stage 09's bridge and beating the pair of pink mummies at the end of the stage proved an elusive achievement for a very long time. When, on a subsequent loan of the game, I somehow managed to survive the mummies by a hair's breadth, my brother (who was providing moral support on this particular excursion) and I watched in horror as Simon plummeted into a cavern beneath the castle. This was new, uncharted territory, the first stage of the second half of the game, unmapped in the Official Nintendo Player's guide. The dark, claustrophobic colour scheme and spooky music stood in stark contrast to the bright blue hues of Block 3's open-air bridge and upbeat theme tune, Wicked Child. I dodged swooping bats and slimy mermen and jumped onto a floating platform, only to immediately see Simon bonk his head on a stalactite and plummet into the murky lake below. My brother and I did the only thing we could do: burst out laughing. Near the later parts of a lot of early NES games, nearly everything becomes variations on a theme. 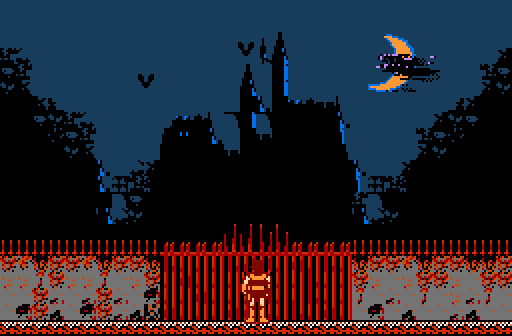 Castlevania, however, continuously throws new things at you: new monsters, new obstacles, new environments. Every step of the way brought a new challenge, and required new skills to overcome. I wound up playing the game's sequel before I managed to crawl out of that pit, and it would be even longer before I managed to survive the fleaman-dropping eagles, bobbing skeletal dragons, and Frankenstein's Monster and his mad cohort Igor who guarded the remainder of Block 4. The rest of the game worked in a similar pattern. A month or a year would pass, I would borrow the game again and again, and I would eventually find myself good enough to pass through another Stage, reach another Block. One day, I somehow managed to get past the Grim Reaper, only to be thwarted by the swooping bats that guarded Dracula's clock tower. When I finally did make it to the Count, in a boss battle that I find challenging even today, he soundly defeated me again and again. 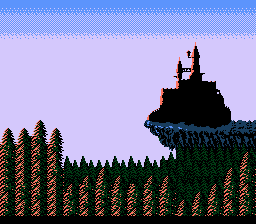 It wasn't until sometime after playing the third game in the series that I defeated Dracula and his bright blue monstrous alter-ego and finally saw the end of the very first Castlevania title. By then, the series had firmly rooted itself in my consciousness, and it has never left. There are a number of things I love about Castlevania, but one of the dearest things about the series is its treatment of its subject matter. I was a very fearful child, plagued by relentless, chronic nightmares that persisted into my teens and made the prospect of going to bed at night and sleeping a fantastically terrifying ordeal. Anything could set me off—a particularly gory VHS jacket at the video rental store, a Halloween episode of The Hogan Family where a character dreamt the everyone turned into zombies, or even a pair of eyes in the darkness, stalking the cast of Scooby Doo, Where Are You? Something would root and fester in my imagination, and manifest itself when the lights went out, tormenting my sleep and causing me to bolt awake too terrified to even call for help. At the same time, however, I was utterly fascinated by ghosts and monsters. My love of Halloween rivalled my love of Christmas (and still does); Jack Prelutsky's It's Halloween was one of my absolute favourite books, I watched The Rescue of Pops Ghostly that worked with our VHS light gun system Action Max over and over again, even without the gaming peripherals attached. And Castlevania was a perfect game for me. Often creepy but never scary, Castlevania's monsters weren't hiding and stalking you; rather, you faced them head on, whip in hand. Even the later titles I played, like the deliciously atmospheric Nintendo 64 offerings, chose action over terror. The series, too, always had a dose of lighthearted humour, from the monster movie actor name parodies in the first game's credits to the crazy in-jokes and outlandish creatures dotting the later titles. Konami is a company that isn't afraid to laugh at itself (just look at the Parodius series), and Castlevania is no exception. It was the perfect exercise in empowerment for a terrified little boy like me. No surprise, then, that where my brother had a collection of toy guns in his closet, I kept a self-fashioned whip made from an altar-robe tie in mine. After all, nothing keeps the monsters in line like a whip-crack to the face.